Hey guys, been a while. So, after a long time coming, I was finally able to start my rebuild. She’s come a long way since the start but I figured while I wait for more parts (and money) I’d post about it. Quick history - bought the bike 6 years ago, found out it had a LOT of issues, started to fix a few things here and there, turns out I was really good with zip ties. Bike was in at least one bad front end accident (no steering stop, small crack in frame). She had the scars to prove it. So much so that I’ve never considered taking her to a shop to get looked at because I would have been pretty embarrassed. Anyways, this last couple of weeks I had some free time (yay Thanksgiving) and set about a teardown. I’ve had second gear issues for a while now. Last edited by Brandon35; 12-10-2018 at 02:29 PM. So far, so good Brandon. How about the wheel bearings, steering neck, and swing arm bearings? Hopefully you'll never be this deep in the bike ever again. Off this topic, did you get the platform you wanted? Did SERE s*ck As much as I think it did? Yeah I checked all the bearings and re-greased them - none of them were grinding or looked worn/bad. I just hope the fix worked! As a side note, This is the third time my sprocket nut has been super loose so i need threadlock and really torque her down. As for good old Ft. Rucker, SERE was definitely not the most fun, but it was a good learning period. I’ve actually been on hold for a while waiting for common core to start (lots of people here). Just crossing my fingers I can select Apache! Bled the front brakes tonight (rear rebuild to come) and everything I saw online was telling me to get a vaccum thingy. I didn’t, and it was still a piece of cake. Not sure if the ss lines make it easier, but after getting straight fluid and no air (and no lever pressure), I cracked the banjo bolt at the master cylinder and a ton of air came out. Soon as I did that I got brake pressure. Didnt take much time at all, things are starting to come together. .... New copper washers throughout, right? Of course yes, new washers, new (correct) fluid, new pads, clean rotors,etc. doing it all right this time. Having a hard time figuring out why my triple tree always wants to be turned slightly to the right when the alignment gets done for the forks. The forks are straight, everything seems to line up and the wheel spins nicely, yet the triple tree is consistently off-center. Steering stem bearings seem fine, no wiggle and no binding. Thoughts? Alignment, only the lower is tight, axle, fender, anything else is loose....... Grab a fistfull of front brake and force the front to compress all the way multiple times? I'll try that first. Would be a shame to have to replace the clamps but if that's what it is I wont hesitate. If you didn't align the forks by the method I have described, they're not aligned. Hope it will work out for you. 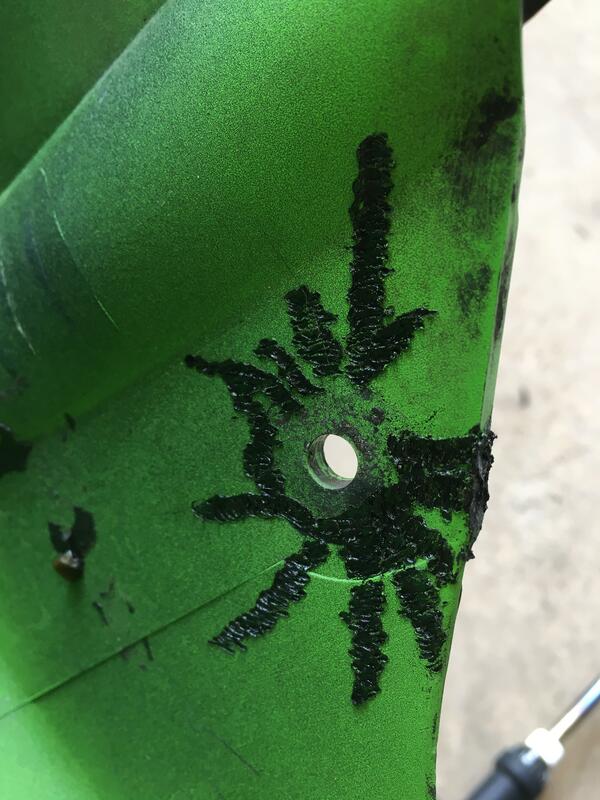 Had to take the engine out and split the case again - turns out one of the forks had fallen before I had everything tight and it got wedged off of the shaft fixed that. Put the engine back in and she shifted like butter. 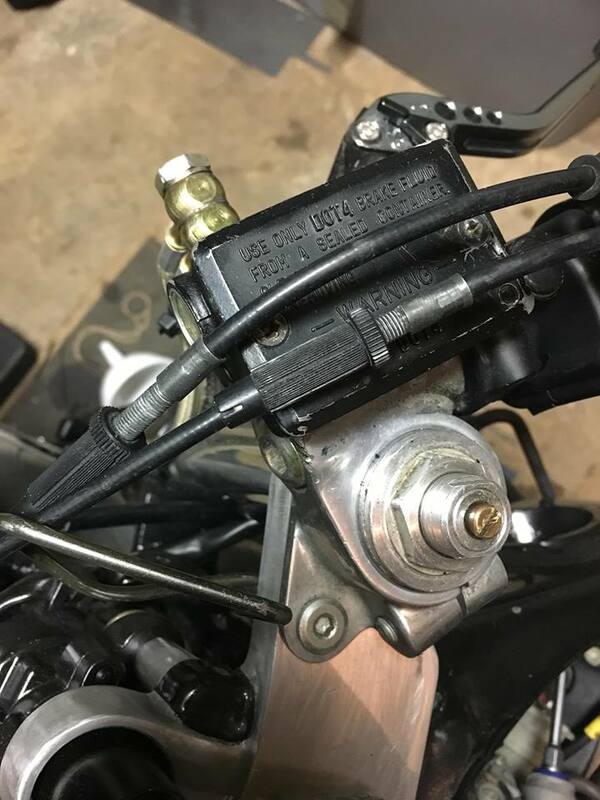 Next, I upgraded to an 06' throttle assembly, had to add a few silicone washers for the longer length but overall not a bad fit, and much much better than the old start button throttle assembly. Wired in a thin start/kill switch and drilled some holes for them to sit in perfectly. Should probably take a picture of that instead of the cables going over the res. Completely rebuilt the rear brake - new seals and all. She needed it (broke a seal on disassembly). After that, I re-upholstered my seats with some walmart fabric. Not a bad job if you use a heat gun and take your time. Lastly, not pictured is the safety wiring I started. Drilled a hole in my oil drain bolt and wired that and the oil cooler banjos. Also did my oil filter. I'm thinking once I do my tires I'll wire the brakes. I have a new (to me) lower yoke with good bearings to put on once I buy my tires, front and rear wheel bearings, and new bolts all around. That should straighten my front end out. After that, the only thing left is to buy track fairings well down the road when I have another, newer bike to use on the street. Last edited by Brandon35; 01-21-2019 at 11:26 AM. 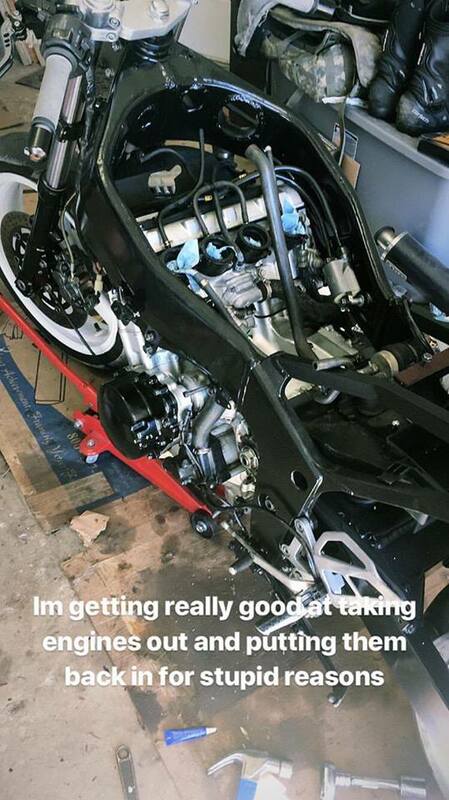 Brandon, I don't recall if you re-sprung the bike for your weight...... Well worth the money. Imho the second best mod you can make. Once I fixed the fork caps and did my oil flush job, I sprung the front for my weight. I believe the rear was good to go for my weight already, but I plan on checking again after my tire change. Yesterday I did a thing. 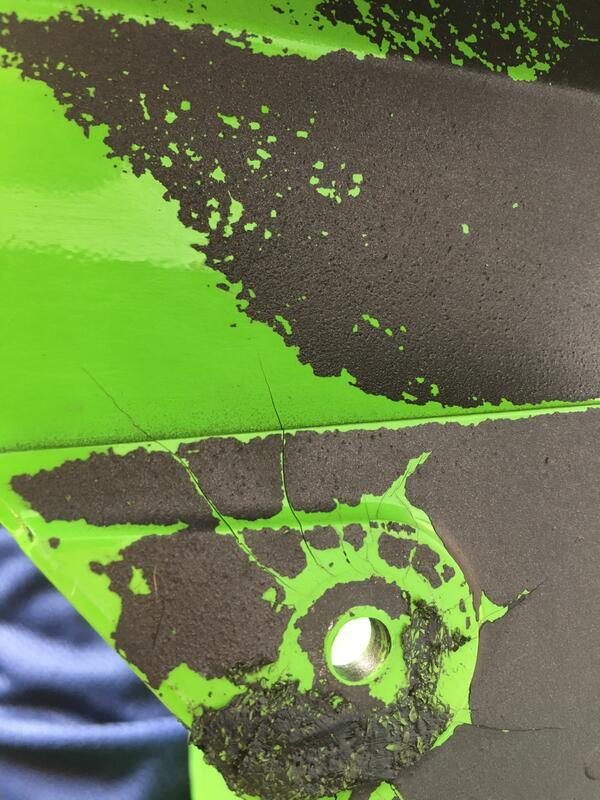 Never had the correct front fender so I ordered a used one to paint. Found out after a deep clean that it has severe cracks all around each bolt hole, so I used my cheapo soldering iron and did some plastic welding. Think it turned out alright in terms of strength and now she’s looking good. 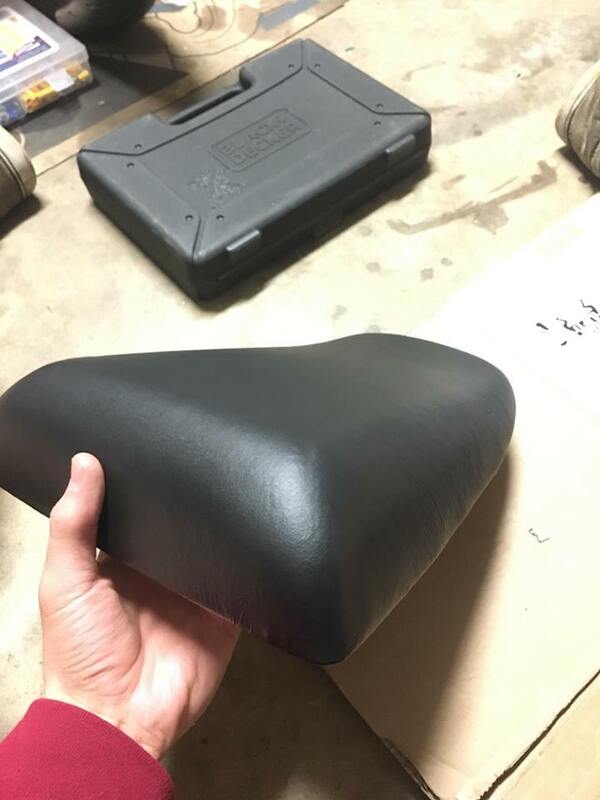 I sanded the front fender and my new rear hugger (found out it was real carbon fiber, bought on ebay from a guy who didnt need it - it needs some holes drilled still) and painted them satin black. Did some wet sanding before a final coat to really bring out the smoothness. I’ll save the install for my new Q3+’s, wheel bearings and new (to me) lower clamp.